We’re at the 10th anniversary of the stock market’s low point of the Great Recession: March 2009. Since then, the US market has risen by almost 4 times. Real estate has done even better. Plenty of investors make decisions looking at the recent past. If that’s your strategy, you might want to reconsider. Here’s why. The chart above compares two 10-year periods: 1999-2009 (5 bars on the left) and 2009-2019 (5 bars on the right). It reports annual performance of US stocks (dark blue), non-US stocks (orange), bonds (gray), real estate (yellow) and commodities (light blue). Talk about two very different decades. Fast forward 10 years, to today. 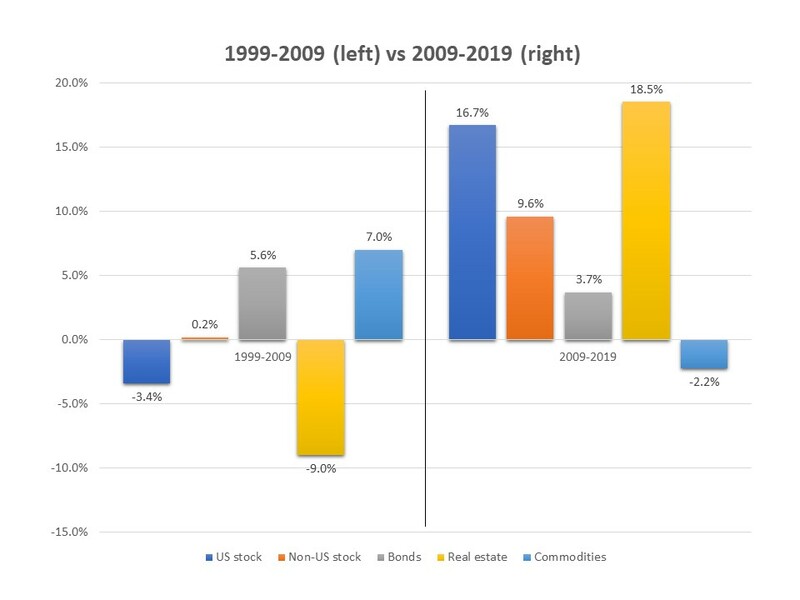 If, in 2009, you had invested based on the decade you had just survived, you would have missed two of the greatest investing opportunities in a century: the US stock market’s run from 2009-2019, and real estate’s run over the same period. You would also have missed attractive non-US stock returns. Decide how much risk you can take, and use that money for stocks and “alternative” investments like real estate. The last century strongly suggests stock and real estate will do well, long-term. Keep the balance — your cushion — in bonds, with a bit of cash. Diversify. Don’t just buy US stocks, or large stocks, or stocks in industries you like, or real estate. By spreading out your risk, you lower it and are likely to do better. Then, brace yourself for long cycles that will test your conviction. A decade can seem like forever. It’s not.